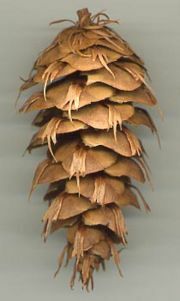 Gymnosperms (Gymnospermae) is the name for a group of seed-bearing (and thus vascular) plants whose seeds are formed "naked" on the scales of a cone of cone-like structure, unlike the angiosperms) whose seeds are formed in an ovule that is enclosed and that develops into a fruit. The term gymnosperm comes from the Greek word gumnospermos, literally meaning "naked seed." The production of seeds distinguishes the gymnosperms and the angiosperms (also called flowering plants) from other members of the vascular plants. Together, the gymnosperms and angiosperms are called seed plants (Spermatophyta). The gymnosperms offer important economic, ecological, and aesthetic values. Economically, the soft-wood conifers are known for their valued timber and paper production. Ecologically, they provide food and homes for animals, and in many ecosystems are the dominant plants. Aesthetically, the gymnosperms, many of which are evergreen, offer year-round beauty in otherwise desolate northern climates in the winter, and they include the tallest, largest, thickest, and oldest living things, inspiring works of art. They also touch the human spirit by serving as decorative plants, and many species are popular as Christmas trees. The harmony of creation is also reflected in the symbiotic relationship that many species of gymnosperms have with animals, such as birds and squirrels, which are integral to the dispersal of their seeds. Gymnosperms include four groups of seed plants: Pinophyta, Ginkgophyta, Cycadophyta, and Gnetophyta. In each of these groups, the ovule is not completely enclosed by tissues of the sporophyte. Gymnosperms are heterosporous, producing microspores that develop into pollen grains and megaspores that are retained in an ovule. After fertilization (joining of the micro- and mega- spore), the resulting embryo, along with other cells comprising the ovule, develops into a seed. The seed is a sporophyte resting stage. The most familiar of these groups are the conifers, many of which have tough, needle-like leaves, designed to minimize water loss, making them common in dry and cold regions of the world. Ginkgo biloba is the only living species left within the Ginkgophyta. The leaves are deciduous and fan-shaped. Today, this plant is mostly found in cultivation because of its hardiness in urban environments, and only found in the wild in isolated areas in China. The Cycadophyta, comprising 10 living genera, are identified by their short stems and palm-like leaves, and mostly found in tropical regions of the world. Gnetophyta, comprising three living genera, are common in arid regions. The division includes the taxonomically closest living relatives of the angiosperms. It remains unclear whether the Gnetophyta are the sister taxon to angiosperms, or whether they are sister to, or nested within, other extant gymnosperms. The conifers, division Pinophyta, also known as division Coniferae, are woody plants, the great majority being trees with just a few being shrubs. The size of mature conifers varies from less than one meter (39 inches), to over 100 meters (328 feet). Typical examples of conifers include cedars, cypresses, douglas firs, firs, junipers, kauris, larches, pines, redwoods, spruces, and yews. 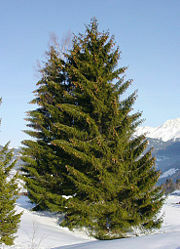 The conifers are now accepted as comprising six to eight families, with a total of 65-70 genera and 600-650 species. Species of conifers can be found growing naturally in almost all parts of the world, and are frequently dominant plants in their habitats. The world's tallest, largest, thickest, and oldest living things are all conifers. The tallest is a Coast Redwood (Sequoia sempervirens), with a height of 112.83 meters (370 feet), and the largest is a Giant Sequoia (Sequoiadendron giganteum), with a volume 1486.9 cubic meters (52,502 cubic feet). The thickest, or the tree with the greatest trunk diameter, is a Montezuma Cypress (Taxodium mucronatum), 11.42 meters (37.5 feet) in diameter. The oldest is a Great Basin Bristlecone Pine (Pinus longaeva), about 4,700 years old. Conifers are of immense economic value (the largest of the gymnosperms), primarily for timber and paper production; the wood of conifers is known as softwood. The conifers are an ancient group, with a fossil record extending back about 300 million years to the Paleozoic in the late Carboniferous period; even many of the modern genera are recognizable from fossils 60-120 million years old. Other classes and orders, now long extinct, also occur as fossils, particularly from the late Paleozoic and Mesozoic eras. Fossil conifers included many diverse forms, the most dramatically distinct from modern conifers being some herbaceous conifers with no woody stems. The leaves of many conifers are long, thin ,and needle-like, but others, including most of the Cupressaceae and some of the Podocarpaceae, have flat, triangular scale-like leaves. Some, notably Agathis in Araucariaceae and Nageia in Podocarpaceae, have broad, flat strap-shaped leaves. In the majority of conifers, the leaves are arranged spirally, exceptions being most of Cupressaceae and one genus in Podocarpaceae, where they are arranged in decussate opposite pairs or whorls of 3-4. In many species with spirally arranged leaves, the leaf bases are twisted to present the leaves in a flat plane for maximum light capture. Leaf size varies from 2 mm (0.08 in)in many scale-leaved species, up to 400 mm (15.7 in) long in the needles of some pines (such as Apache Pine, Pinus engelmannii). The leaves are often dark green in color, which may help absorb a maximum of energy from weak sunshine at high latitudes or under forest canopy shade. Conifers from hotter areas with high sunlight levels (such as Turkish Pine, Pinus brutia) often have yellower-green leaves, while others (such as Blue Spruce, Picea pungens) have a very strong glaucous wax bloom to reflect ultraviolet light. In the great majority of genera, the leaves are evergreen, usually remaining on the plant for several (2-40) years before falling, but five genera (Larix, Pseudolarix, Glyptostrobus, Metasequoia, and Taxodium) are deciduous, shedding the leaves in autumn and remaining leafless through the winter. The seedlings of many conifers, including most of the Cupressaceae, and Pinus in Pinaceae, have a distinct juvenile foliage period where the leaves are different, often markedly so, from the typical adult leaves. Most conifers are monoecious (having unisexual reproductive units of both sexes appearing on the same plant), but some are dioecious (having unisexual reproductive units occurring on different individuals) or subdioecious (a female plant may sometimes produce small numbers of male cones or vice versa). All are wind-pollinated. Conifer seeds develop inside a protective cone called a strobilus. 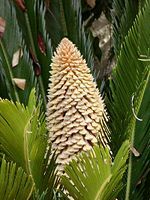 The cones take from four months to three years to reach maturity, and vary in size from 2 mm (0.08 in) to 600 mm (23.6 in) long. In Pinaceae, Araucariaceae, Sciadopityaceae, and most Cupressaceae, the cones are woody, and when mature the scales usually spread open allowing the seeds to fall out and be dispersed by the wind. In some, most often firs and cedars, the cones disintegrate to release the seeds, and in others (such as those pines that produce pine nuts) the nut-like seeds are dispersed by birds, which break up the specially adapted softer cones. In some fire-adapted pines, the seeds may be stored in closed cones for up to 60-80 years, being released only when a fire kills the parent tree. In the families Podocarpaceae, Cephalotaxaceae, Taxaceae, and one Cupressaceae genus (Juniperus), the scales are soft, fleshy, sweet, and brightly colored, and are eaten by fruit-eating birds, which then pass the seeds in their droppings. These fleshy scales are (except in Juniperus) known as arils. In some of these conifers (most Podocarpaceae), the cone consists of several fused scales, while in others (such as Taxaceae), the cone is reduced to just one seed scale or (such as Cephalotaxaceae). The Ginkgo (Ginkgo biloba), commonly known as the Maidenhair Tree, is a unique tree with no close living relatives. It is classified in its own division, the Ginkgophyta, comprising the single class Ginkgoopsida, order Ginkgoales, family Ginkgoaceae, genus Ginkgo, and just the one species, G. biloba. It is one of the best known examples of a living fossil, with fossils recognizably related to modern Ginkgo from the Permian, dating back 270 million years. They diversified and spread throughout Laurasia during the middle Jurassic and Cretaceous, but became much rarer thereafter. By the Paleocene, Ginkgo adiantoides was the only Ginkgo species left in the Northern Hemisphere. In the past, the Ginko has also been placed in the divisions Spermatophyta or Pinophyta. Ginkgos are medium-large deciduous trees, reaching 20–35 m (65.6–115 feet) tall (with some specimens in China being over 50 m (164 feet)), with an often angular crown and long, somewhat erratic branches. They are usually deep-rooted and resistant to wind and snow damage. Young trees are often tall and slender, and sparsely branched; the crown becomes broader as the tree ages. During autumn, the leaves turn a bright yellow, then fall, sometimes within a short space of time (1–15 days). A combination of amazing disease resistance, insect-resistant wood, and the ability to form aerial roots and sprouts means that ginkgos are very long-lived, with some specimens claimed to be more than 2,500 years old; a 3,000 year-old gingko is reported in Shandong province in China (Lewington and Parker, 183). The leaves are unique among seed plants, being fan-shaped with veins radiating out into the leaf blade, sometimes bifurcating (splitting) but never anastomosing to form a network. Two veins enter the leaf blade at the base and fork repeatedly in two; this is known as dichotomous venation. The leaves are 5-10 cm (rarely to 15 cm) (2-4 in; rarely to 6 in) long. The popular name "Maidenhair tree" is because the leaves resemble some of the pinnae of the Maidenhair fern Adiantum capillus-veneris. Ginkgos are dioecious, with separate sexes, some trees being female and others being male. Male plants produce small pollen cones with sporophylls each bearing two microsporangia spirally arranged around a central axis. Female plants do not produce cones. Two ovules are formed at the end of a stalk, and after pollination, one or both develop into seeds. The seed is 1.5-2 cm (.6-.8 in) long. Its outer layer (the sarcotesta) is light yellow-brown, soft, and fruit-like. It is plum-like and attractive, but the seedcoat contains butanoic acid and smells like rancid butter (which contains the same chemical) when fallen on the ground. Beneath the sarcotesta is the hard sclerotesta and a papery endotesta and nucellus. The fertilization of ginkgo seeds is unusual in that it utilizes motile sperm; cycads are the only other seed plants with this feature. When the pollen reaches the pollen chamber, two sperm are produced, one of which goes on to fertilize the ovule. Despite several myths to the contrary, fertilization of ginkgo seeds is complete before they fall in autumn. Cycad phyta are an ancient group of seed plants, dating back to the early Permian (280 million years ago) or possibly the Carboniferous (300-325 million years ago), consisting of 305 described species, 10-12 genera, and 2-3 families. Global distribution reflects a more unified distribution during the time of the supercontinent Gondwana. They are identified by their large crown of compound, palm-like leaves and short trunk. They are dioecious and commonly confused with palms or ferns . The plant division Gnetophyta or gnetophytes comprise three related families of woody plants. The gnetophytes differ from other gymnosperms in having wood vessels as in the flowering plants (Angiosperms or Magnoliophytes), and it is thought that Gnetophytes may be the group of spermatophytes most closely related to the flowering plants. The Gnetales consist of a single genus, Gnetum, which are mostly woody climbers in tropical forests. However, the most well-known member of this group, Gnetum gnemon, is a tree. The seeds produced are used to produce a crispy snack known as 'Keropok Belinjau' in Malaysia and Indonesia. The Malay name for this plant is 'belinjau'. The Welwitschiales comprise only one species, Welwitschia mirabilis. It grows only in the deserts of Namibia. The plant is strange in having only two large strap-like leaves for all its life. These grow continuously from the base, and are usually tattered at the ends from flapping in the winds. The Ephedrales consist of a single genus Ephedra, and are known as the jointfirs because they have long slender branches which bear tiny scale-like leaves at their nodes. Ephedra is reputed to have medicinal properties, but has recently been banned by the Food and Drug Administration (FDA) due to harmful and potentially deadly side effects. Bowe, L. M., G. Coat, and C. W. dePamphilis. 2000. Phylogeny of seed plants based on all three genomic compartments: Extant gymnosperms are monophyletic and Gnetales' closest relatives are conifers. Proceedings of the National Academy of Sciences 97:4092-4097. Chaw, S., C. L. Parkinson, Y. Cheng, T. M. Vincent, and J. D. Palmer. 2000. Seed plant phylogeny inferred from all three plant genomes: Monophyly of extant gymnosperms and origin of Gnetales from conifers. Proceedings of the National Academy of Sciences 97:4086-4091. Lewington, A., and E. Parker. 1999. Ancient Trees. London:Collins & Brown Ltd. ISBN 1855857049. Soltis, D. E., P. S. Soltis, and M. J. Zanis. 2002. Phylogeny of seed plants based on evidence from eight genes. American Journal of Botany 89:1670-1681. This page was last modified on 3 April 2008, at 21:02.